Breakfast is served daily from 7:15 am to 10:30 am the Club’s covered patio overlooking the white sand beach of White Sound Harbor. Enjoy generous portions of a variety of breakfast dishes including omelets, French Toast made with Bahamian bread, fluffy pancakes, traditional eggs Benedict, fresh fruit and much more. Lunch begins at 11:30 am and ends at 2:45 pm daily, served on either the covered patio or outside deck. The lunch menu offers soup, salads, sandwiches, platters and combinations featuring fresh, local Abaco seafood. Be sure to try the Club’s signature homemade lobster salad and other Bahamian specialties. Dinner at The Green Turtle Club is a culinary experience not to be missed. Our dinner menu sets a new standard for Caribbean dining as our staff achieves culinary excellence with classic dishes and a knowledge of regional recipes that appeal to all palates. In the evenings the tables are draped with linens so guests may dine by candlelight on the patio and enjoy views of White Sound Harbor under the moon. For a more formal experience, the Club has a warm and elegant candlelit dining room as well. Sits up on the bluff with spectacular views of White Sound Harbor. Located poolside, guests can enjoy a refreshing dip in the pool and then relax poolside with a chargrilled burger and favorite frozen libation. Happy hour is daily from 4:00 pm to 6:00 pm with $1 off all drinks. The Turtle Pool Bar & Grill is open March through August, from 12:00 pm to 7:00 pm. 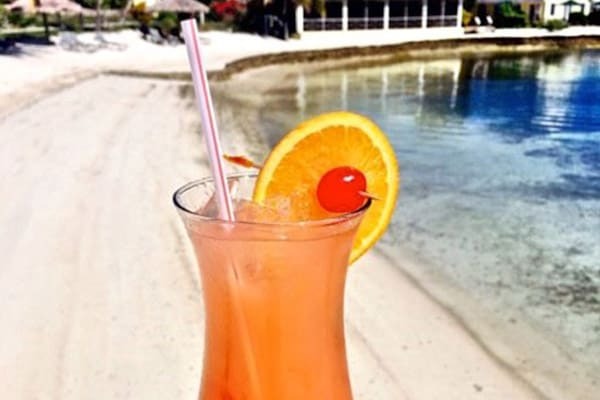 The Club specialty, the Tipsy Turtle Rum Punch, was chosen by Esquire Magazine as the best rum punch in all of the Caribbean. 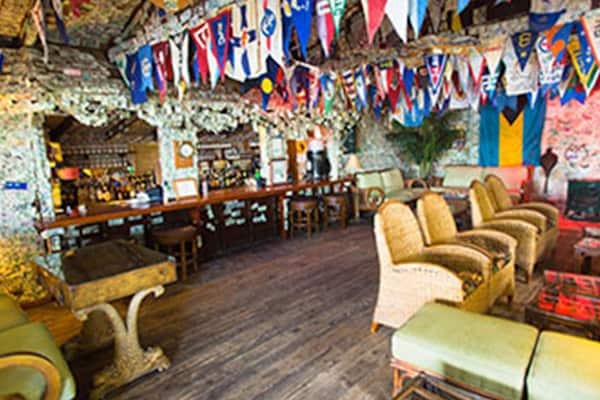 The Club features a variety of local live music with musicians and bands from mainland Abaco. On Wednesday nights, The Green Turtle Club plays host to “The Number 1 Band in The Nation”… Green Turtle Cay’s own Gully Roosters Band! The Gully Roosters perform originals of their own and reggae classics under the buttonwood tree on the deck at The Club. There is nothing better than grooving to the band under the stars to a driving rhythm that is guaranteed to keep you dancing. Happy Hour is the happiest two hours of the day! From 4:00 pm to 6:00 pm. A pre-dinner cocktail gathering, accompanied by complimentary hors d’oeuvres, begins nightly at 6:45 pm in the Yacht Club Pub. Board games and books are available to you and any new friends you have made. A log fire is lit on cool winter evenings, adding to the charm and ambience of the Yacht Club Pub. The Jolly Roger Bar & Bistro overlooks the Bluff House Marina and White Sound anchorage, and is the closest dining and entertainment venue to the club. A short golf cart ride away, the Jolly Roger serves lunch and dinner daily, and theme nights are frequent. Choose from dining on their large outside dockside deck, or inside in with air conditioned comfort. The bistro showcases island food and traditional favorites. The “Wrecking Tree” is one of the few places that will make conch salad to order. Don’t miss the popular “McIntosh’s Bakery & Restaurant”, on the street going up the hill facing the cemetery. Everybody’s all time favorite is “Laura’s Kitchen”. You’ll find it just up the street from the town dock. Here you will get your plate piled high with food reminiscent on an Amish restaurant and all for a reasonable price (no alcohol here). A reservation is strongly suggested. On the “bottom” of the main street next to the freight dock is Plymouth Rock Bar, Restaurant, Liquor and cigar store. Big name, but a small space with counter seating only for eight. Be sure to visit Mikes Sundowner, right on the water facing Abaco Sea. 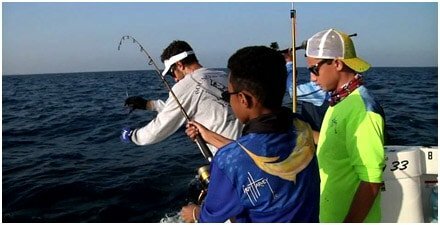 Their schedule tends to be sporadic, so best to hail them on your VHF. A newer restaurant in town is Pineapples Bar & Grill, with a great pool for luncheon and dinner guests and on occasion live music in the evenings. It is located on the eastern side of Settlement Harbour located at the Other Shore Club and Marina on Black Sound. The newest restaurant on Green Turtle is Harvey’s Island Grill, on the harbour side of town. No alcohol is served but BYOB. Here the menus consists not your typical Bahamian fare, but state side favorites such as duck and lamb etc. and all at reasonable prices. By the way, it’s another Harvey; Guy’s only involved as a customer! 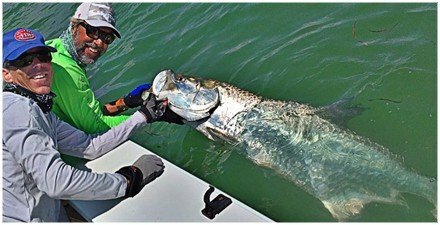 For decades the favorite night spot for the visiting yachtsman has been “Miss Emily’s Blue Bee Bar”. 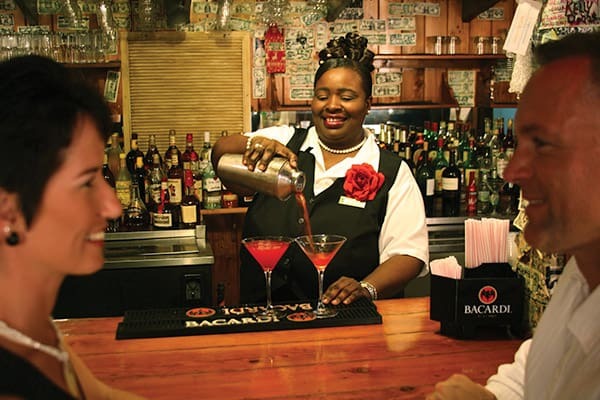 Miss Emily was the originator of the Bahamian national drink – the Goombay Smash. Sadly, she passed away in 1997 but the traditions of her “establishment” are now being run by her daughter Violet. The house specialties are Goombay Lobster or Blue Bee Special Grouper. Just up the hill from the Blue Bee is the island’s hot spot, the “Roosters Rest” home of the most famous band in the Bahamas – the Gully Roosters – playing Reggae and Calypso. No trip to Green Turtle is complete without catching a Gully Roosters session. The Roosters Rest tends to operate sporadically, or be “open with a west wind” as they say in the islands, but they’re at the Green Turtle Club every Wednesday!